If you are unwilling to provide safe zones or scratching posts, there are SEVERAL kitties needing homes that have already been declawed and abandoned because of the onset of other problems that cutting off their toes presented. 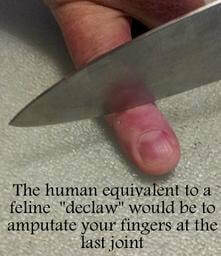 We BEG you to do a search for one that is already declawed to adopt & save another poor soul from this unnecessary violent act, or better yet, choose another species altogether. Learn How to Easily Trim Your Kitty's Claws, Why They Scatch & The BEST Scratching Posts! The Ultimate Scratching Post & Petfusion Ultimate Cat Scratcher Lounge are excellent long lasting scratching recommendations to help kitty exercise, be happy, and refrains them from having to resort to carpet or furniture. It really is that easy to accommodate their needs! CLEAN YOUR LITTER BOX AT LEAST TWICE PER DAY! ​There is much more to litter than simply providing a kitty material to cover her elimination. Various kinds of bacteria & parasites inhabit soiled litter & intestinal parasites are frequent in kitties. Hookworms, roundworms & the microscopic organism Toxoplasma gondii are some of the most common parasites found. Transmission happens when parasite eggs in your kitty's fur or skin are ingested during her daily grooming routine. Once infected she can pass parasite eggs or organisms through the stool & multiple cat households will be infested. The best defense is to remove soiled litter as often as possible. Paying attention to your kitty's eliminations will alert you to possible health issues. If you don't have the time, or like the hassle of litterbox cleaning, there is even a robot self cleaning litter boxes available! Click on the Auto-pets link for more information and receive $25.00 off your order if you place your order through KPOH.org! Dry Cat food DOES NOT HELP CLEAN TEETH! ​90% of kitties suffer from gingivitis & periodontal disease because of the lack of dental care. Please brush your kitty's teeth and provide a dental treat daily. Here are some of the dental products that KPOH uses & recommends. Once your kitten is fully immunized against viruses, she is immune for years, and often for a lifetime. Vaccination against bacterial pathogens creates a memory in your pet’s immune system that helps protect her if and when she’s exposed to dangerous organisms. 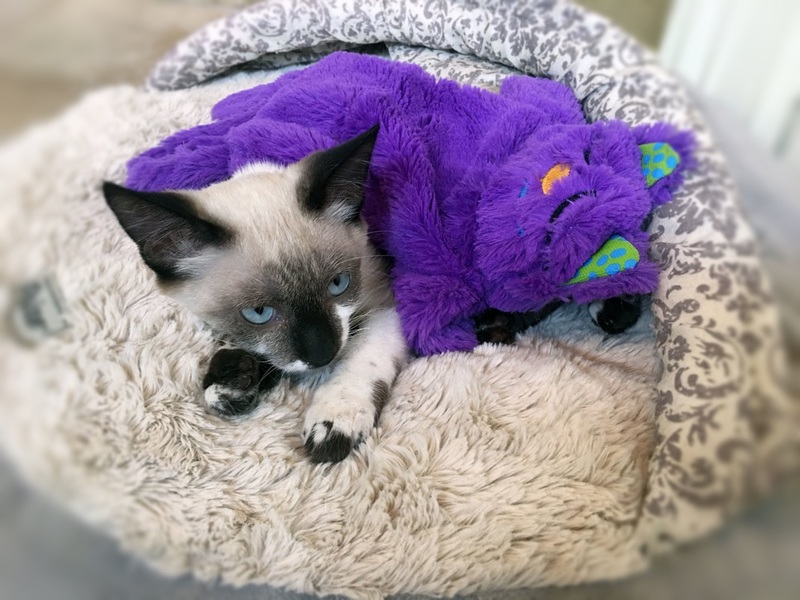 After your kitty has received all her vaccinations, the antibodies she develops to the viruses she’s been immunized against will actually protect her from the same viruses introduced in future vaccinations. Vaccines can have side effects. So re-vaccinating for the same pathogens year after year is more than just a waste of your money – it also poses ever increasing risks to your pet’s health. This test will help you and the doctor determine whether your kitty has adequate immunological protection from previous vaccinations. 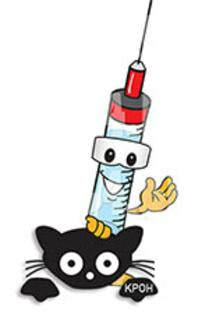 Antibody levels can be measured from a blood draw. 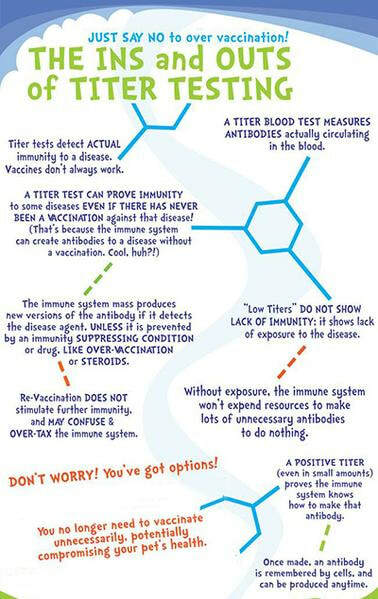 The type of titer that best assesses immune system response to vaccines is called the indirect immunofluorescent antibody (IFA) test. ​Kitties can make beds out of most anything, but they prefer round objects to curl up in, hammocks & for their beds to not be on the ground level but preferably as high & hidden as possible. It's their natural wild instinct to be safe as they typically sleep at least 18 hours daily. Traditional views that kitties require the freedom to roam outdoors have few pros. The belief that indoor kitties tend to be lazy & overweight is not true & can be combated with scheduled play times & being fed less dry kitty food. Outdoor kitty enthusiasts claim kitties love the outdoors, which is often true, especially if not provided with adequate stimulation indoors. However, the dangers outweigh the benefits. The same owners who promote the outdoors often insist that kitties deserve their freedom. Such views, however, are outdated and outranked by most animal professionals. The majority of Veterinarians, Humane Society, Animal Protection Societies, & Adoption Agencies believe cats should be indoor only pets. ​Kitties left outdoors indeed, have a very short life span. 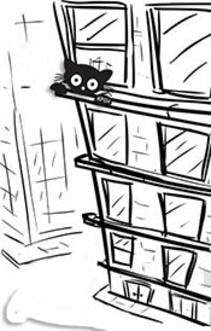 Dangers to an outdoor kitty far outweigh any benefits and responsible owners are urged to do what is best for the kitty. FLEAS - did you know that flea & tick preventatives shorten your kitty's life span by 25% & that flea collars have caused MANY deaths? Indoor only kitties do not require flea prevention. For outdoor strays, you may wish to provide human grade Diatomaceous Earth. Please do not poison your kitty with unnecessary pesticides & only use seasonally. Fleas are important to prevent & treat as they can lead to several health problems. Never EVER self medicate your kitty with ANY medication that is intended for human use EVER. This includes pills, tablets, cold remedies, antihistamines, essential oils, laxatives, hydrogen peroxide, TUMS, bleach - ANY common ailment remedy for human use. Even though you have good intentions of helping a sick kitty -- DO NOT SELF TREAT BY USING THE INTERNET AS GUIDANCE as it is not specific to your individual kitty, nor do you KNOW all the factors involved -- Do what you can to get kitty to be properly seen by a Vet. If finances are an issue, please do a search & call around explaining your circumstances & let your Vet know why you feel your kitty is sick. It may be something that they can assist with over the phone. Take a video & send it to their email to get their advice. No one wants to see a kitty suffering & if they cannot help, ask to be referred to someone that can. 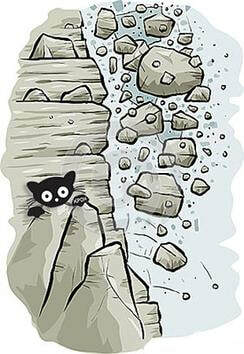 KEEP TRYING - KITTY NEEDS YOUR HELP!! !